Terrestrial isopods or woodlice (Crustacea, Oniscidea) represent the largest suborder of Isopoda and are the only group of crustaceans fully adapted to live on land. Up to date, over 3,700 species are known but many more are expected to be discovered as soon as many areas, especially in the tropics but also in temperate regions, have been properly investigated. Woodlice occur in almost any kind of terrestrial habitat, from the seashore to high in the mountains. They mainly occur in humid environments but some have adapted to very dry habitats, such as sub-deserts and even deserts. Woodlice are decomposers and represent one of the major components of soil fauna. Due to their limited distribution and strict ecological needs, they are excellent biogeographical and ecological indicators. 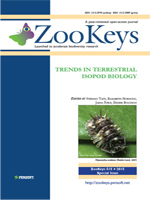 This special issue of ZooKeys includes a collection of 14 papers presented at the 9th International Symposium on Terrestrial Isopod Biology, which was held at Poitiers, France, from 26 to 30 June, 2014. Over 70 participants from 15 countries discussed the latest achievements in systematics, biogeography, morphology, physiology, evolutionary biology, ecology and ecotoxicology of terrestrial isopods. The symposium and the present volume are dedicated to the memory of Prof. Michael R. Warburg, Haifa, for his great contribution to the knowledge of terrestrial isopod biology.